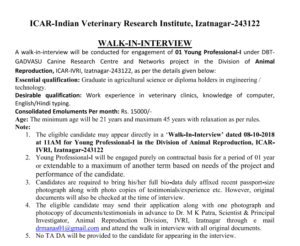 IVRI Young Professional Recruitment 2018: Diploma Engineering Jobs Today – ICAR – Indian Veterinary Research Institute, Izatnagar – 243122 is going to organise a Walk in interview for only one vacancy of Young Professional – I. Only interview will be organised as a part of the selection procedure. And, Board of recruitment has already finalised that they are not going to pay any Dearness Allowance or Travelling allowance for appearing in the interview. Application Form filling procedure under this recruitment is offline and not online. 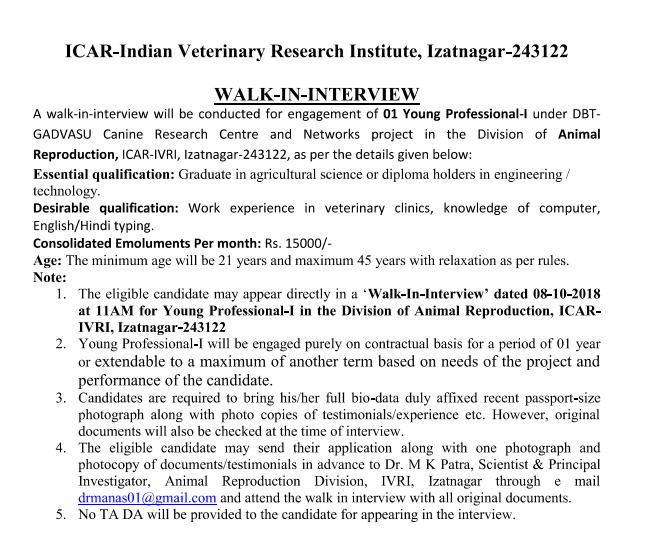 Thus, along with one photograph and required documents, Offline Registration Form under this IVRI Recruitment 2018 will have to be sent to Dr M K Patra, Scientist & Principal Investigator, Animal Reproduction Division, IVRI, Izatnagar through e-mail [email protected] and attend the Walk-In-Interview with all original documents. Under this vacancy recruitment, 21 years is the minimum age limit and 45 years is the maximum age limit. Apart from that, initially, the recruitment will be of one year mainly because it is a recruitment on the contractual basis. But, depending on the duration of the project and performance of the candidate while working, the tenure of working can be extended. As of now, that’s all you needed to know about IVRI Young Professional Recruitment 2018.